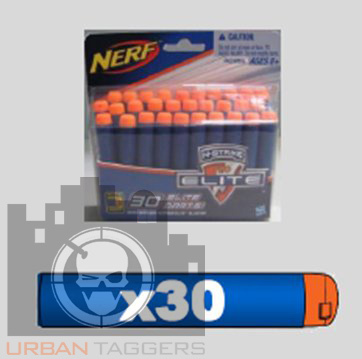 Adult Fans of Nerf » Blog Archive » Spring Cleaning Super Giveaway! Like giveaways? Who doesn't like free stuff! 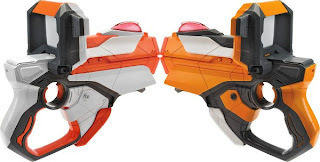 Our pals at Adult Fans of Nerf are giving away some pretty decent kit, AND what's cool is apparently this competition goes out internationally to blaster fans everywhere. I tell ya, this is a big deal because from our personal experiences, the shipping is a killer so get in before they change their mind!! Entries close March 14. Details below. Other than the somewhat tiny grip, I quite liked the original HVZ Zombie Fighter blaster, so I'm quite keen on this new Air Zone branded repaint. Air Zone's new colour scheme for their blasters is looking very schmick (right down to their stealthy looking "one-shot-only-cos-i-lost-it" darts) and it's good to see they've done more than just repaint the gun- adding rather novel attachments including a secondary rocket launcher! Nerf Mods & Reviews have got themselves one- check out the vid for their review, or continue on to their page at the link below. Neo Creations: Nerf Hailfire. What Does It Really Look Like? 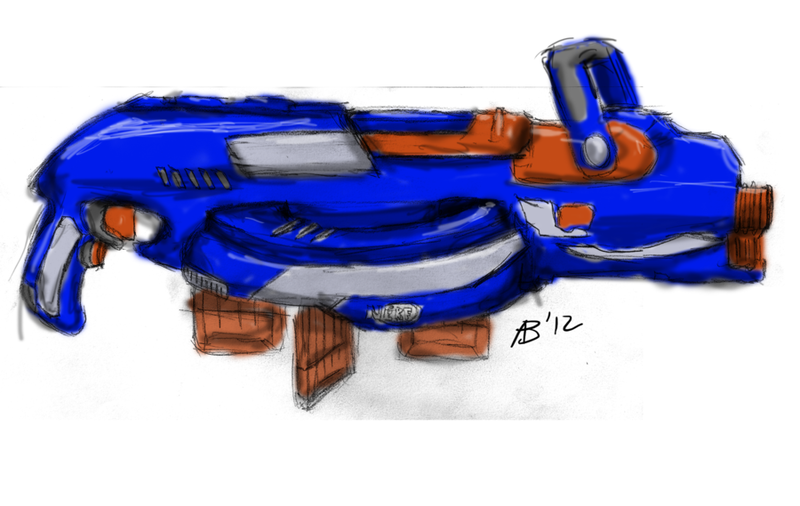 Ben from Neo Creations sent us this very cool "artist's rendition" of what the upcoming N-Strike Elite Hail Fire could look like, based on the video Nerf posted earlier today. It's pretty sweet; thoughts? Dvice have some nice looking close ups of the upcoming Nerf Snapfire 8. 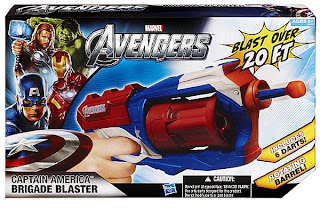 A semi automatic blaster without batteries? ooh la la! :D Pics after the jump. 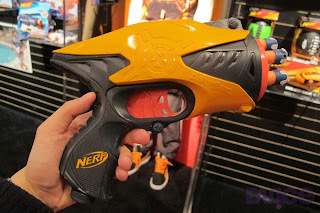 Tactical Tag: Toy Fair 2012: Neat stuff! The New York Toy Fair is always the one to watch for new blaster products; unfortunately New York is a tad far away from wee Canberra, Australia so we have to live vicariously through our US pals to bring us the news:) Toy Spy have got a fantastic gallery of images from the Hasbro stand; I've gone through and posted the relevant ones here, but do go over and check out their site to see more Hasbro goodness. Images after the jump. 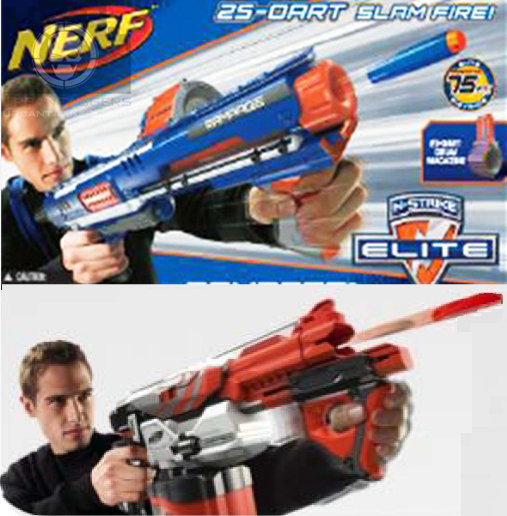 Just for funsies- check the packaging for two new upcoming Nerf blasters- one being the N-Strike Elite Rampage- the other the Vortex Pyragon. Oh yes..It's coming. 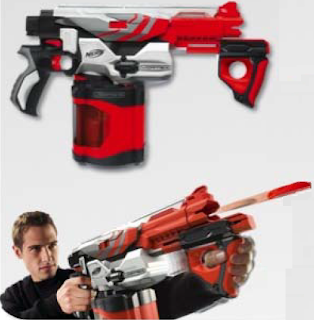 Hasbro have announced it on their Nerf Nation Facebook page, and created a page for the upcoming new Elite series on their website. 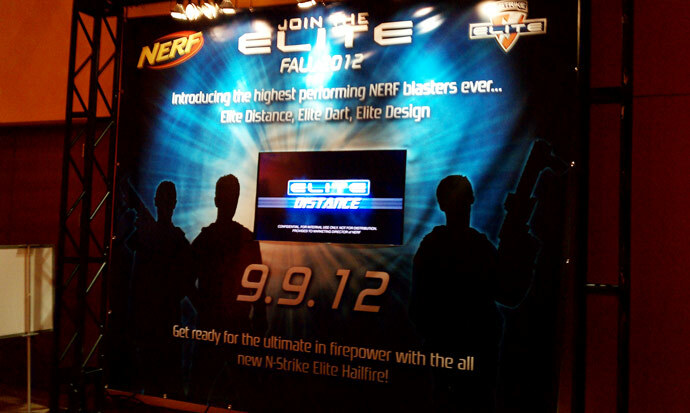 "The standout N-STRIKE ELITE blasters will officially launch on 8.1.12, with the most impressive blaster in the collection hitting shelves on 9.9.12." It looks like there's a good chance the new most impressive blaster WILL be called the "Hail Fire" as confirmed on German blaster forum Blasted.de. Tactical Tag: New Vortex Blaster: Pyragon! Also several European sites are listing it already?! 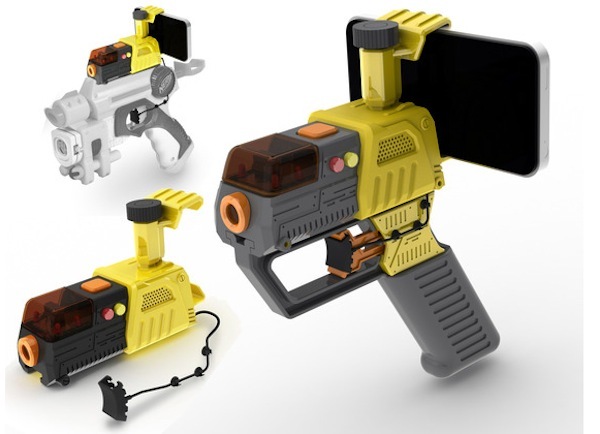 "AppTag Laser Blaster brings first person shooter console gameplay to smartphones in the real world. 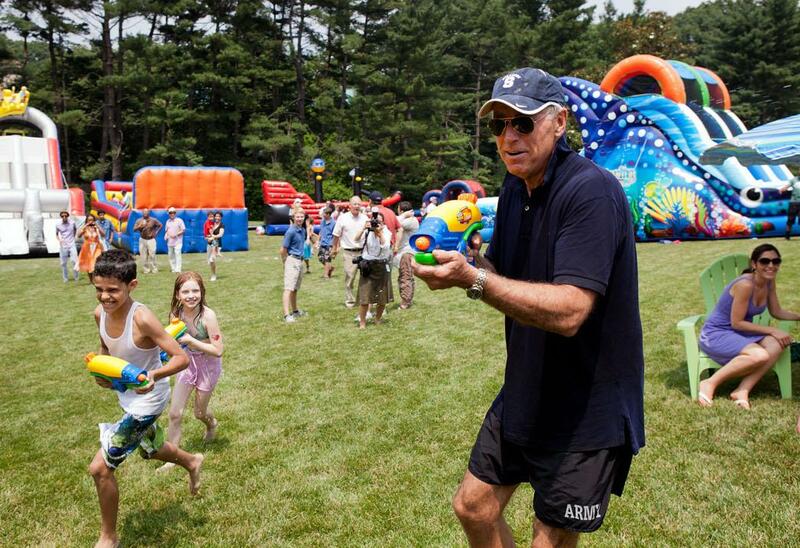 Obviously, as with any blaster toy, the object is to shoot your friends! 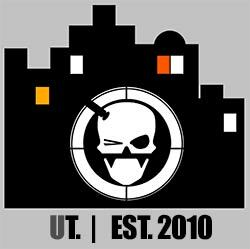 The AppTag does the shooting and the smartphone keeps score and tracks everything else, the App even adds Augmented Reality objects such as medkits, armour, weapons and ammo packs! For targeting we use a focused infrared beam and sensor for the 'laser' so it's totally safe. Each unit has an IR sender and receiver, and the AppTag unit works together with an attached smartphone or iPod Touch." Their official Kickstarter page is here, which means you can help fund the project AND get yourself some units when they're released in June. Dowit. 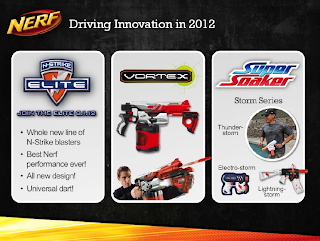 "In 2012, NERF fans will experience a revolutionary new high-performance class of NERF N-STRIKE blasters to collect and carry into battle. Taking the powerful technology featured in the popular N-STRIKE line to the next level, the innovative N-STRIKE ELITE line gives NERF NATION the extreme performance it craves. The standout N-STRIKE ELITE blasters will officially launch on 8.1.12, with the most impressive blaster in the collection hitting shelves on 9.9.12. 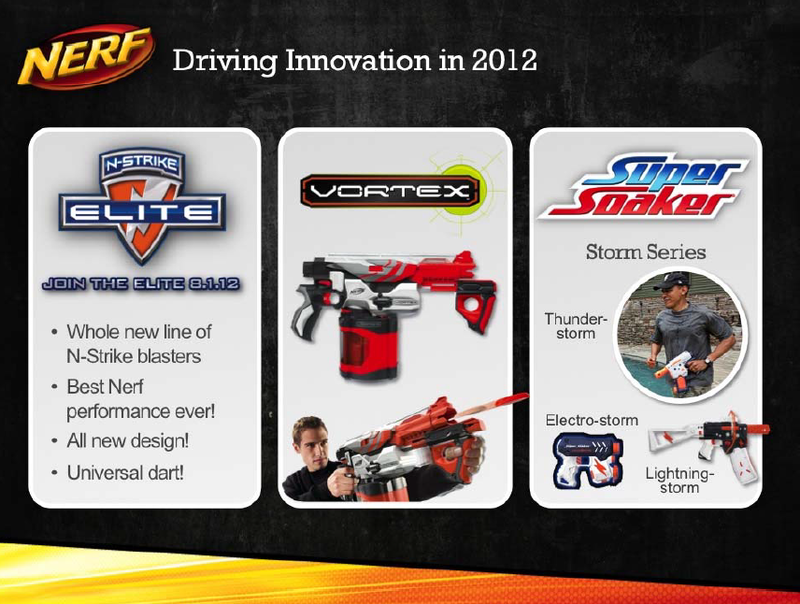 "While fans will have to stay tuned for more details about the N-STRIKE ELITE line, the brand will also be introducing new VORTEX disc blasters, NERF SUPER SOAKER water blasters and more. 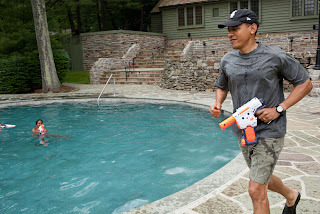 Continuing the "NERF or Nothin'!" 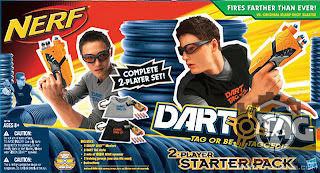 fun, the brand brings fans a completely new way to play with its sports gear in 2012 with the introduction of FIREVISION technology, an innovative enhancement featured in the debut FIREVISION SPORTS collection which allows for play in both daytime and dusk. Only those wearing NERF FIREVISION FRAMES eyewear will be able to see the action with NERF FIREVISION SPORTS Football and additional FIREVISION sports items once the lights go down." 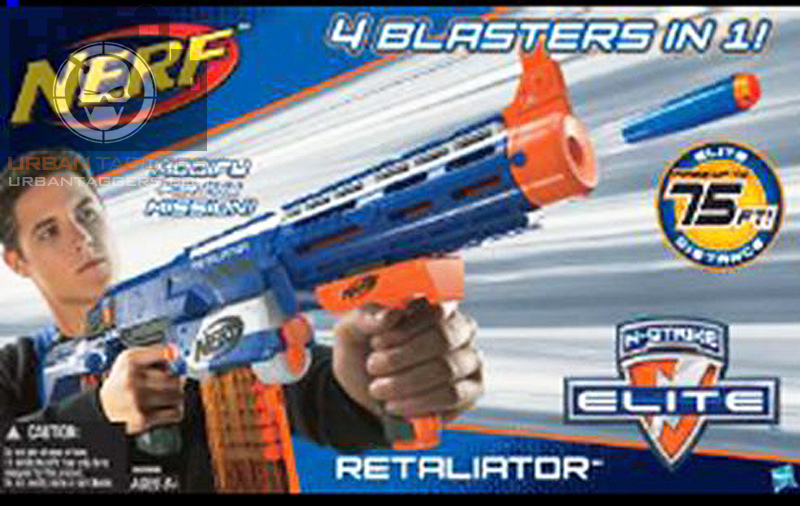 Given the two we listed look like revamps of the Raider and Recon, I'm going to suggest neither are the "most impressive" blasters in the Elite line. 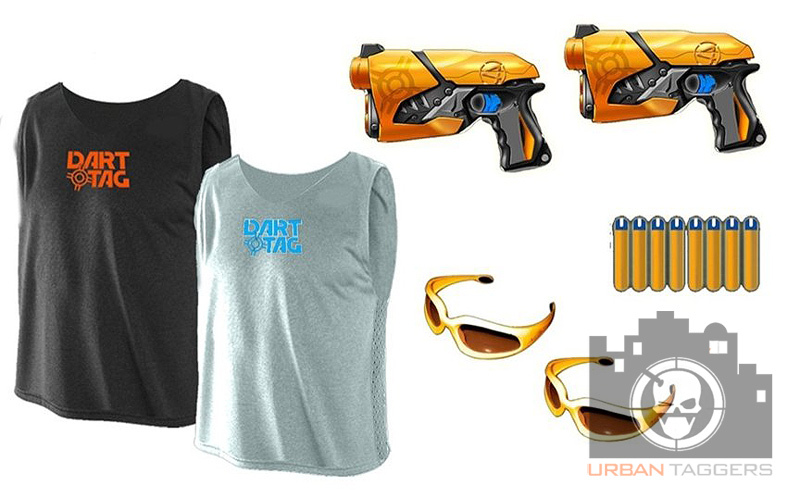 Airzone 8 Dart Blaster Combo Pack. 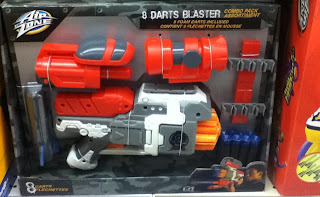 I saw this on Tactical Tag today; a new repaint of the HVZ Zombie fighter blaster but labelled as an Air Zone 8 Darts Blaster Combo Pack. I am really liking the look of Air Zone gear lately- their colour schemes are awesome and this particular combo pack raises the bar from the original HVZ unit by including a variety of attachments (how useful they are is questionable, but they look pretty tough?!) that can be attached to the blaster in a variety of ways. We've been talking about this for a while now, but dum dum dum daaaa.. it's official:) Hasbro are bringing Lazer Tag back, and with an all new HUD display via an apple iPhone/iTouch. Which bothers me because I HATE apple products... but this might just be the thing to force me to buy one:P If the rumours we were hearing (albeit reliable sources!) are true, these should be backwards compatible to an extent with the older Phoenix LTXs and original LTTO gear... which would be very cool. 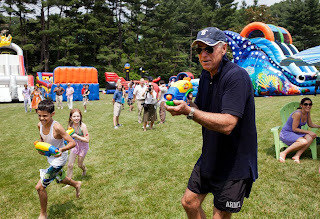 From the makers of the popular NERF blasters comes the revolutionary LAZER TAG system, combining the power, precision and excitement of live-action blaster battles with the high-action, strategic, augmented reality gameplay of traditional video games. To experience the LAZER TAG game, players download the free LAZER TAG app to their iPhone or iPod touch device, connect their device to their LAZER TAG blaster, and find themselves immersed in a world where video games and real life connect. Using either single or multi-player mode, players can engage in a LAZER TAG match featuring either real life worlds or virtual opponents. 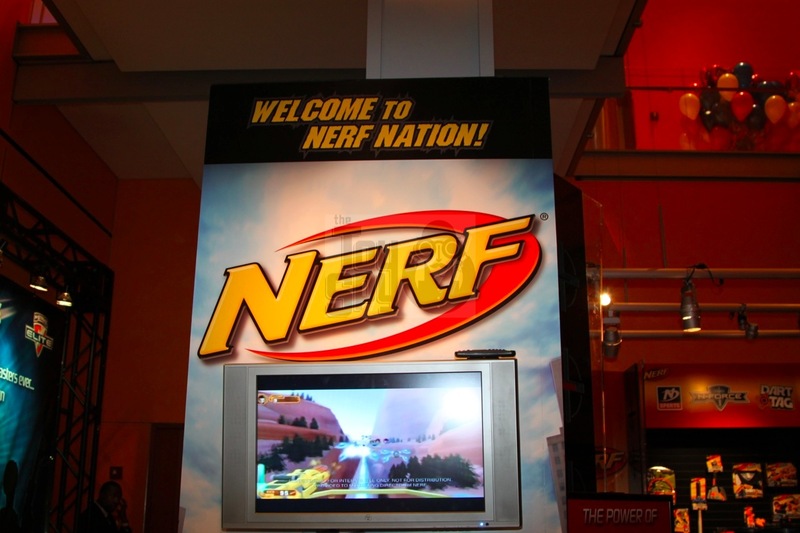 Each LAZER TAG blaster equipped with a device has a virtual firing range of over 250 feet and contains a 'Heads Up Display', or HUD, which allows players to keep track of their gear and remaining power, while also providing a view of the augmented reality targets and enemies in the area. A virtual leaderboard keeps track of each player's profile and, with every successful mission, players will gain in-game access to upgradeable attacks, missions and gear. 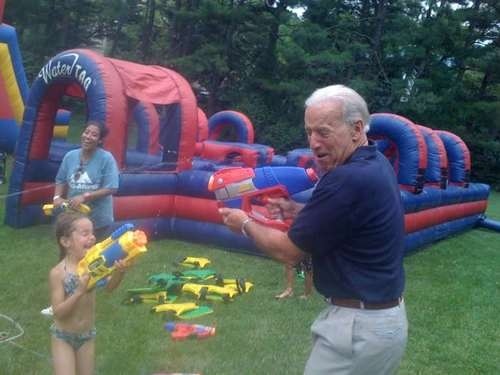 With LAZER TAG blasters, the stakes are high, the game is real. Don't just play it, live it. In continuing with the N-Strike Elite themes of upgrading N-Strike blasters, here we've got some pics of what looks like a souped up N-Strike Raider. Called the "Rampage" (grrrrr what a tough name!) 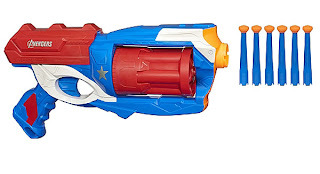 it looks like it's sporting a new 25 round drum, new colour scheme and sans stock; still featuring the slamfire capabilities and it's shooting that mysterious blue and orange tip dart. 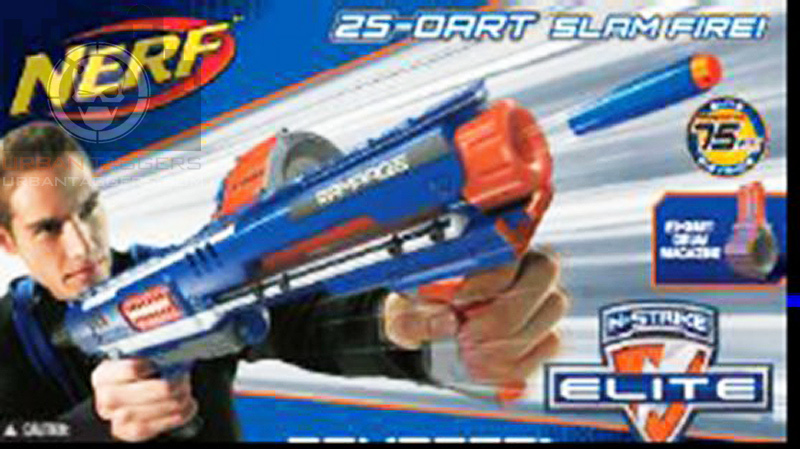 The image below suggests it comes with some form of tactical rail shield attachment, but the earnest dude on the box isn't packing one so am unsure if this is a yay or nay on release. 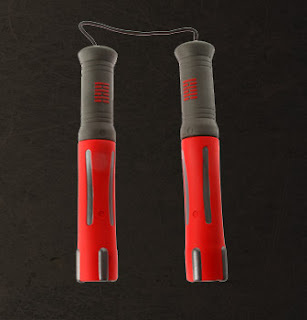 Once again the big news is the new N-Strike Elite line boasts 75 ft distances out of the box. 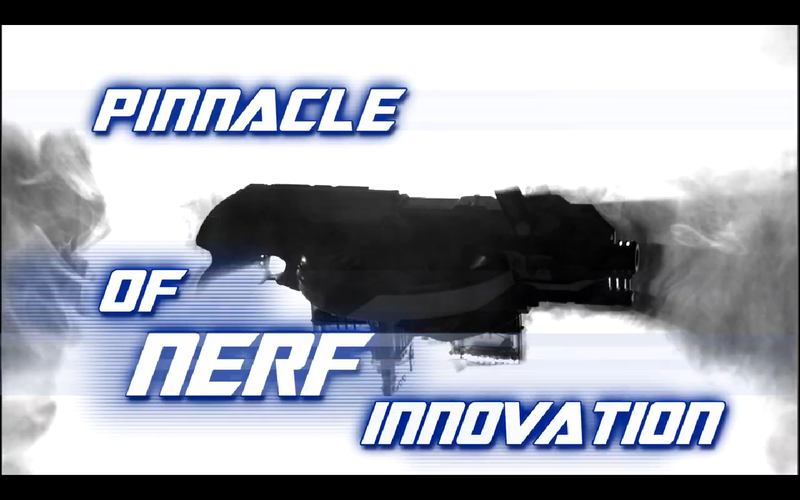 We just received this intel from a very mysterious email; here is a first look at the N-Strike "Elite" Retaliator. From what I can see, it looks like a Recon on steroids but with more than just a pretty new paint scheme. The '4 blasters in 1' text suggests it comes with detachable barrel attachment, stock attachment and bipod; the clip looks a higher capacity to the traditional N-Strike clips,and its shooting a blue and orange tip dart. I'm gonna guess it'll all be made public in a week or so at the TIA Toy Fair, so as always, this is still one for the rumour mill... but oh what a cool rumour it's making! The upcoming GI-Joe Retaliation film has some pretty amazing toys to tie-in with its release; I've been waiting for N-Force Nunchuks for AGES, and while it's hard to tell if these are foam or not, if they are, I'm gonna be getting my Ninja Turtle on in a big way:) More cool stuff after the jump, including revamps of the Nerf Dart Tag Fury Fire, and some very cool masks that might just mean for an alternatives to the ol' Iron Man ones we've sported for a while now..
Like something from a Powerpoint presentation, it seems to suggest all new blasters will be using this new dart. 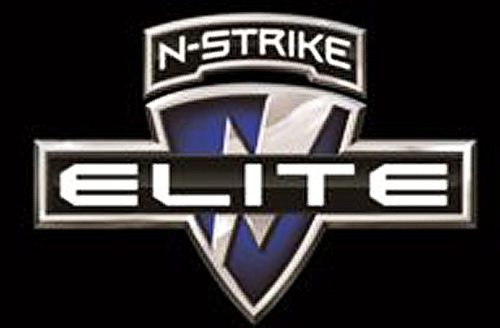 Again, I speculate, but that was always a major criticism of N-Strike..
Nice logo.. what's it about? We just got in some very interesting intel, but interested to hear your thoughts..
Nerf did a pretty good job at re-releasing their Dart Tag line last year but the one blaster I felt let the side down was the single firing Sharp Shot. It looked awesome (and to be honest performed pretty well once modded) but out of the box, it was pretty ordinary to say the least, compared to its big brothers. 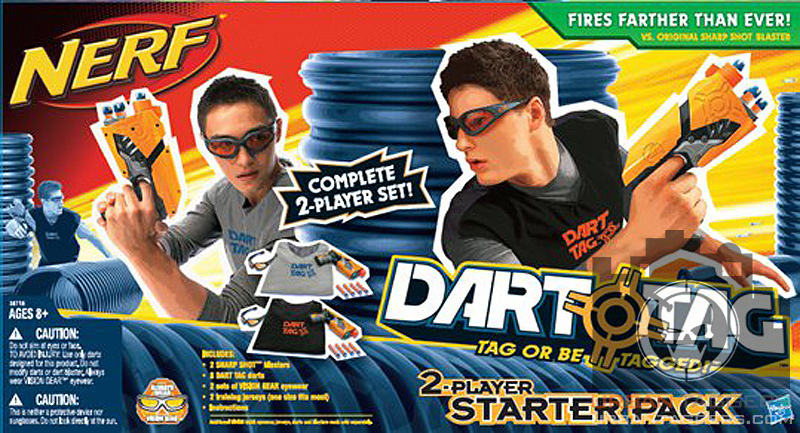 Turns out Nerf will be re-releasing the Sharp Shot; have a look at the above images of the new 2012 Dart Tag 2 Player Starter Pack and you'll see that green bar that says "fires farther than ever!". Other subtle changes are the new coloured training vests, and the Sharp Shot itself sporting a new BLUE trigger, a la the Speed Swarm. This is interesting- while it's common for blasters to be re-released with aesthetic changes (eg repaints or movie tie-in rebrands) , it's not very common at all for them to be updated for performance. As always, this is just intel, but no doubt they'll be on shelves sometime this year. The rest of the merchandise after the jump. "Toy blasters are for kids"
Just a quick random thought..To those out there who carry on about being too "old" for toy blasters, I give you.. 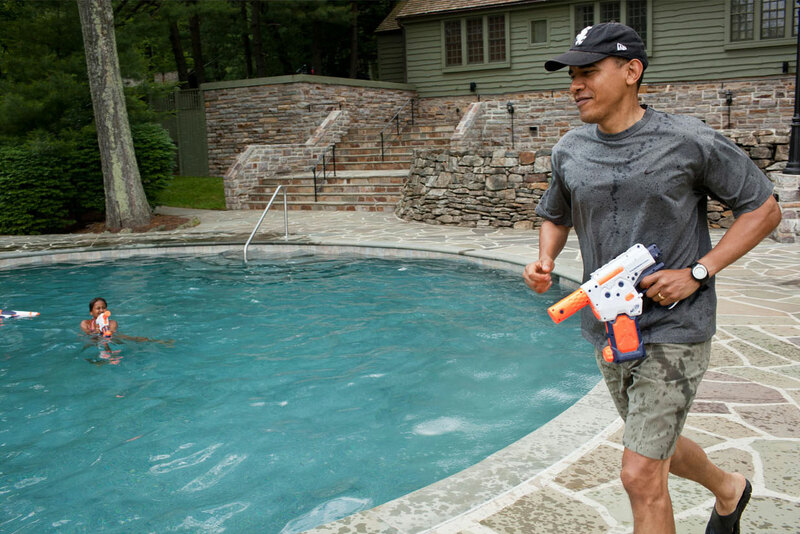 US President Barack Obama with a Super Soaker Thunderstorm. 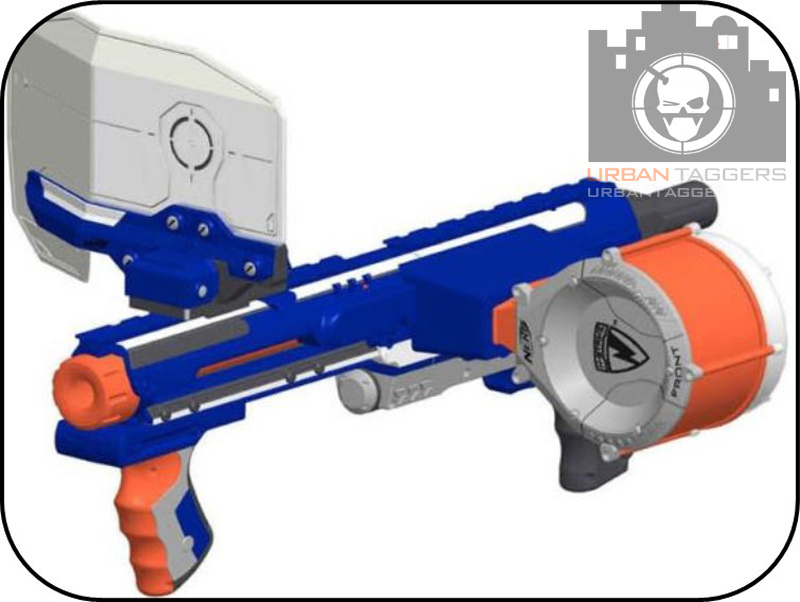 It was always going to happen; Hasbro's Marvel movie tie in gear has always been Nerf related and here we've got the Nerf Big Bad Bow repainted in original Hawkeye of the Avengers colours. 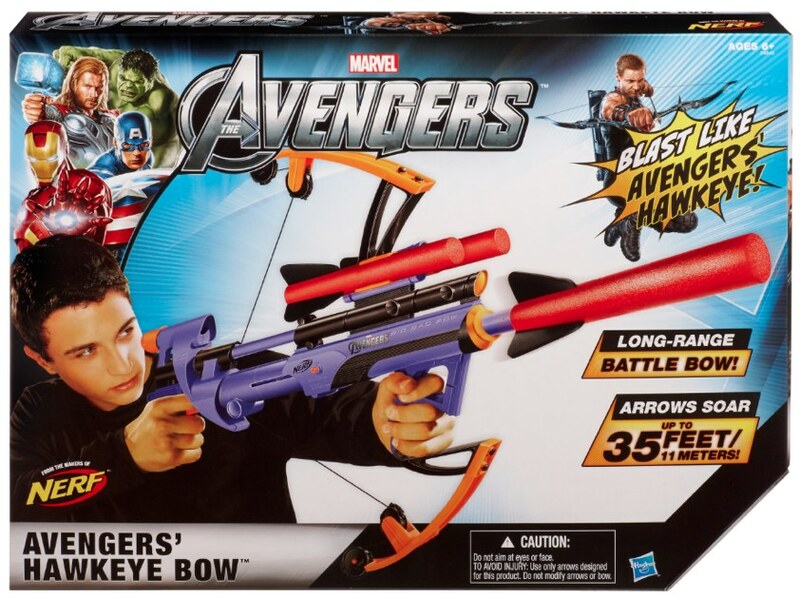 Of course, it looks nothing like Hawkeye's actual bow, but it does suggest you can "blast LIKE Avengers' Hawkeye"- not that its an actual replica... because it's not:) No doubt it'll be out in time before the movie release. A few more pics after the jump. Thanks Jason for the intel.